Have fun on the beach with your family and friends with this Outdoor UV-proof 2-Person Ultra Large Mat Fishing Auto Tent Shelter Beach Shade! Even better, it requires no assembly and sets up quickly. Features: Type: Pop-up Tent Material: 170T Polyester Fabric Fiberglass Rod Color: Blue & Orange Size: 200 x 150 x 110cm/ 78 x 59 x 43inch (L x W x H) Capacity Perosn: 1-2 Person Item Weight: 2.97 pounds Opportunity: Camping, Hiking, Beach, Fishing, etc....... Easy pop-up design, durable and lightweight fiberglass frame and fabric, suitable for beach, camping, hiking Lightweight, compact beach tent provides protection from the sun, rain and wind for all outdoor activities UV protective, large windows for ventilation Providing a spacious interior shelter. 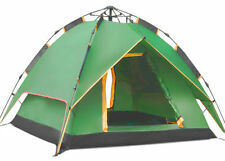 Package Included: 1 x Tent 2 x Tent Rods 1 x Skylight Cloth (Random Color) 4 x Ground Nails 1 x Color Cards 1 x Carrying Bag. Model: Beach Tent. 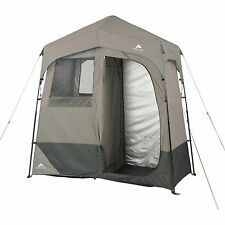 1x Tent With Carrying Bag 6 x Ground Nails. Ground Nail QTY Fold Size Extend Size Outer Material 190T Silver Coated Polyester Cloth. High Standard Steel. Anti-UV Level. Canopy should be water proof. Fits 2 queen air mattresses and more. 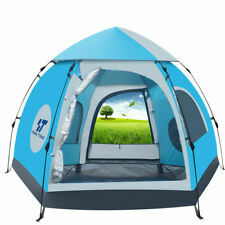 AFFORDABLE HIGH QUALITY - Best buy for a full screen house or screen room tent. Try it, we know you will like it, it’s a new concept that will surprise you. 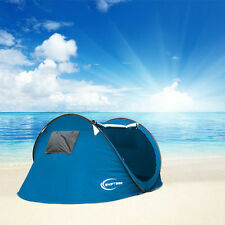 Item Type: Pop up Beach Camping Tent. 1x Tent With Carrying Bag 6 x Ground Nails. Strong, sturdy yet lightweight pole system. Coated material for extra UV protection. YouTube: Wolfwise Pop Up Beach Tent. Ultra-lightweight construction allows for easy transportation with included carrying bag. The rear double pull sliders of the tent makes for more convenient entry and exit. 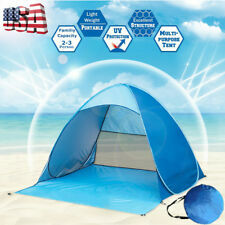 Pop Up Beach Tent Sun Shade Shelter Outdoor Camping Fishing Canopy 2-3 Person. Have fun on the beach with your family and friends with this Outdoor UV-proof 2-Person Ultra Large Mat Fishing Auto Tent Shelter Beach Shade! 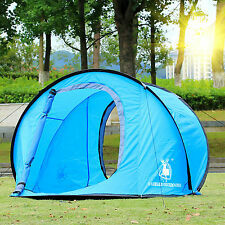 You can use this pop up portable camping tent for hiking shelter, suitable for beach, lake, parks or wherever you like! You'll love it! Made of polyester cloth and 5.0 fiberglass rod. (8)Model: Instant Tent. 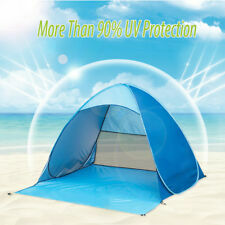 (14)Waterproof & UV resistant 190T polyester used as shelter or a beach tent. Household Appliance. (9)Ideal for camping and outdoor activities. Camping,climbing,hiking,fishing and more outdoor activities. ThisCamping Toilet Tent Provides Privacy. The single U shape door provides a safe and sound lock. It has a zippered door that is easy for you to open and a hanging bag opposite to the door. You can have easy access to this tent. VERSATILITY ?. This multipurpose pop-up tent is accessorized for your maximum convenience! You?ll find a shower opening, towel hanger, clothes hanger, toilet paper holder, personal belongings storage pouch, flashlight hanger, and tent carry bag. 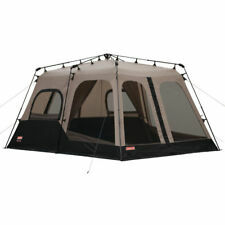 With a center height of 39.5, it is easy for anyone to sit up in this tent. A window and 2 vents provide cross ventilation. Aluminum poles and stakes keep the carry weight to a minimum and the compact size of the stuff sack make this an easy tent to transport. NO RISK BUYING - Carrying bag With the installation instructions, or you can search “ZOMAKE tent” on the ""Youtube"" for the folding video. And you can keep the tent, this is our crazy promise. We don't lie.